Travelling is meant to be comfortable and Easybook wants to provide you as many great services as possible via our platform for wherever you may be going to. As the largest land and sea transport booking website in Southeast Asia, our list of operators is ever-growing to accommodate you with not only tickets but also convenient. Violette Train has joined the list to provide services for your trips around the country known for its pagoda statues and bustling city life. You can book Violette Express train from anywhere in the world at any time; whether you are planning to backpack to Lao Cai or visit Nanning’s science and technology museum in China, Easybook is all set to help kick start the adventures of you! Since joining the transportation industry recently in 2016, Violette Train has been receiving great reviews for their services. If you are travelling within Vietnam or cross the border to China, take note to book train ticket of this operator to experience what the fuss is all about. Return routes for all the mentioned trips above are made available as well. Prices for Violet Train vary for each destination to suit your travel needs. For children under 5 years old sharing a bed with their parent, they are able to board Violette Train for absolutely free but only one child is allowed for each adult. For those aged 5 to 9 years old under the height of 1.3 meters, they will only be charged 75% of the adult price when travelling the North – South routes. Children will need to pay full adult ticket prices if they are travelling within Hanoi – Sapa. Please note that meals on the Violette Express trains are not included with the prices mentioned below for the cabins of 4 beds. 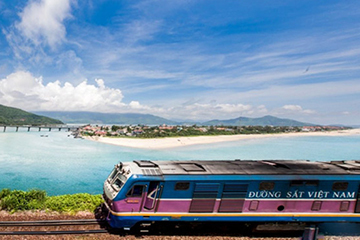 Hanoi to Hue and Danang uses cabins that come with 4 soft berths for a long 791 KM trip. First departure starts at 7:30 PM (cabin SE1), then 10:10 PM (cabin SE19) and 11:00 PM (cabin SE3) for overnight trips. For trips leaving from Danang to Hanoi, the first departure starts at 12:46 PM (cabin SE2), then moves on to 2:13 PM (cabin SE4) and lastly at 6:40 PM (cabin SE20). For trips from Hanoi to Lao Cai, it takes up a total of 294 KM, the first train departs at 8:30 PM (cabinSP7), then continued by 9:30 PM (cabin SP1) and 10:00 PM (cabin SP3). If you choose to leave Lao Cai to Hanoi, the train starts at 7:40 PM (SP8), then at 8:35 PM (SP2) and 9:40 PM (SP4). 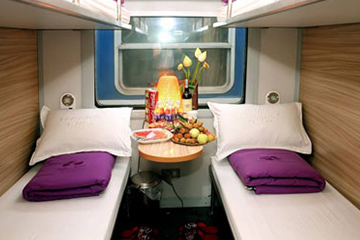 Both Violette Train cabins of 2 beds and 4 beds are equipped with modern facilities and design in order to suit the needs of all travelers. The cabins are properly lit with functioning air-conditioning system so you are able to go rest in the overnight trains comfortably. You will be given complimentary water, fruit, snack and magazines as well so you do not have to worry about getting restless along the way. The Viollete Train staff members are also ready to accommodate to your queries when you are onboard with them to provide you with the best services. If you are travelling from Hanoi to Hue and Danang, you can book the standard 4-berth cabins as the sleeping carriages have been built with clean and modern furnitures. You are able to choose between the 2 and 4 soft berth cabins for travels between Hanoi and Lao Cai that comes with wooden interior to set a relaxing mood as you travel in style. Newspaper is also complimentary with the drink and snack served to you on a desk. Toilets are available on the trains for your convenience as well. Violette Train makes sure they have the necessary amenities for all your travelling needs, which is why they have been receiving so many positive reviews since they were established in 2016. The next time you are in Hanoi and planning to explore Vietnam or even China, don’t forget to make your bookings through our simple-to-use website by following these simple instructions we have prepared for you. Alternatively, you can also have it at the palm of your hand when you download our mobile app for free to your smartphone. 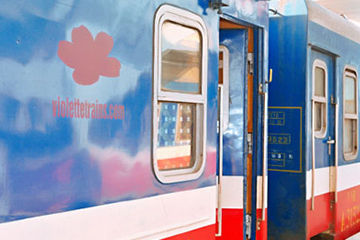 This way, you can literally purchase the train tickets for Violette Train no matter where you are in the world! Whether you will be planning a spiritual trip to visit the majestic temples in Hue or just want to try Beijing’s famous Peking roast duck, Easybook is always ready to help kick start that dream for you.